Donate to the Playground Campaign! Generations of NFS kids and parents have yearned for playground equipment in the rear of the building. It has been discussed and even planned, but never accomplished. Today, our school is more motivated and organized than ever before. We are ready to BUILD NOW, so kids can PLAY FOREVER. It’s common for schools to build playgrounds with private funding - the school budget does not include playground equipment. Our fundraising goal is aggressive, but we are committed to putting a shovel in the ground this summer, so that the playground is ready to be enjoyed in the fall of 2014. Your contribution can be made online through the link above or with a cash gift or check made payable to NFS PTO. 1 Franklin Drive, Portsmouth, NH 03801. Thank you for supporting the New Franklin School Playground Campaign! 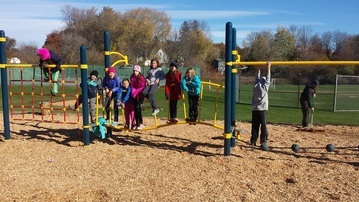 With revised design input from NFS children, parents and staff and some generous in kind donations, our revised playground fundraising campaign goal is $55,000. We are so close to reaching this goal! Thank you to ALL who have donated to date. If you would like to make a donation, please click on the blue "Donate to the playground campaign" button above. Thank you!